In this topic you will learn about the Performance report that is provided as part of the Analytics module. 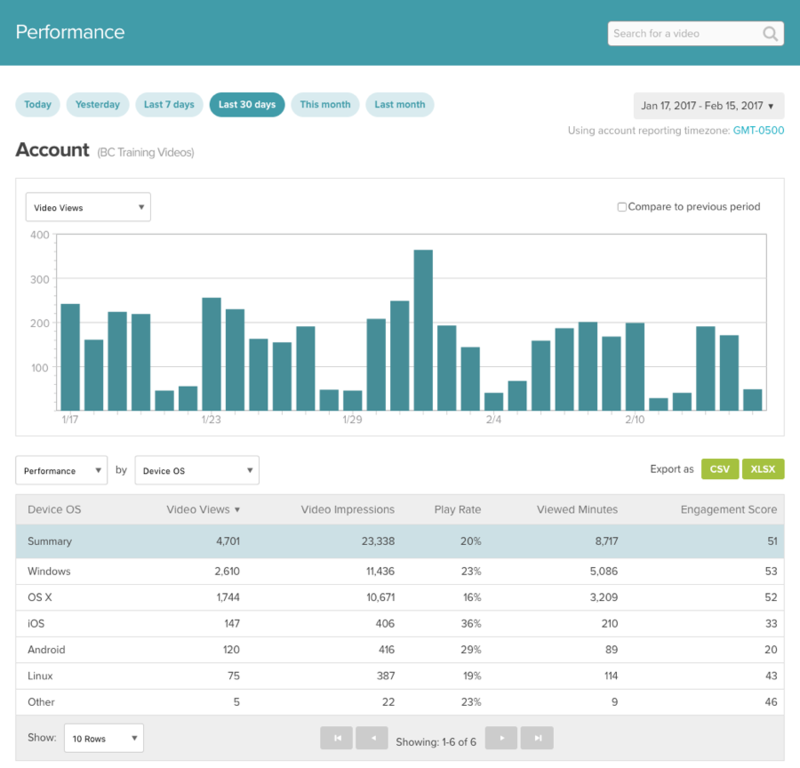 Analytics data is sent automatically by the Brightcove Players, including those provided by the Native Player SDKs. If you are not using a Brightcove Player to deliver Video Cloud videos, you need to instrument the player you are using to send the data to the Data Collector. See the Overview: Data Collection API for more details. Video Bandwidth - Includes bandwidth for videos only. Note that bandwidth data is delayed by 3-5 days. Total Bandwidth - Includes bandwidth for videos, images and player loads. Note that bandwidth data is delayed by 3-5 days. 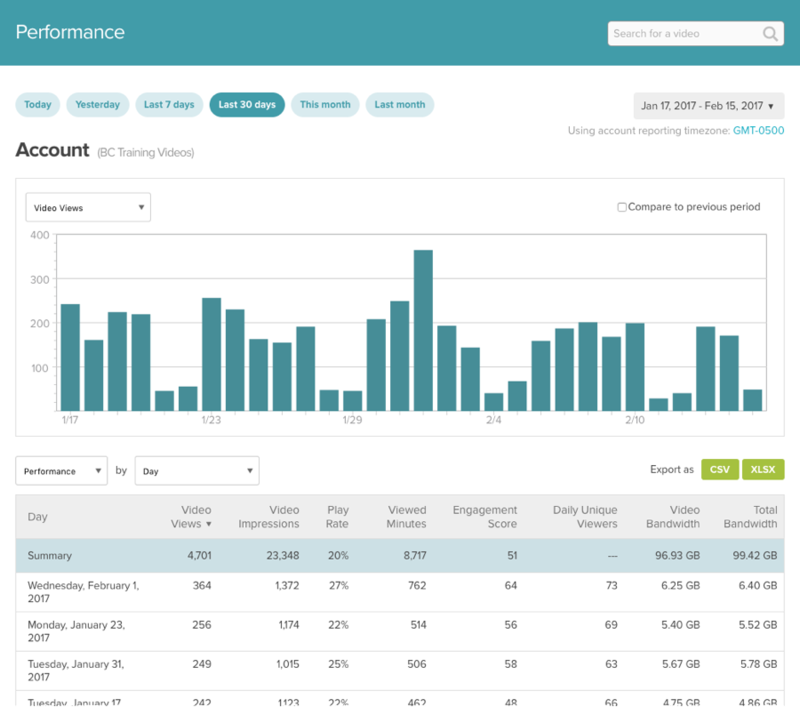 The Analytics reports do include analytics for videos that have been deleted from your account. You cannot search for deleted videos in the Analytics module to see a report on a particular deleted video. To get such a report, you will need to know the video ID for the deleted video and use the Analytics API to generate the report. It takes up to 3 days for data on Daily Unique Viewers and Video Bandwidth data to be available. A video view is not the same as the Views at x% in the Engagement Report. A video view is counted when a video first starts playing back. The views at 1% is recorded when the first percent is watched. The difference here is that if the first percent is watched multiple times (if the video is set to auto-replay, for instance), the count increases, whereas a video view is counted when the video first starts playing back but is not counted on a replay (unless the user reloads the page or watches another video in the playlist, etc). Simultaneous report requests within the same account will execute in series. If the reports have large date ranges and many fields are selected, there may be a delay before all the results are returned. A good alternative is to schedule large reports. The report switcher below the chart can be used to quickly switch to another report. Note that the available dimensions will change based upon the report that is selected. The bottom of the report has controls which let you select how many rows should be displayed and for navigating to other pages. Selecting the Compare to previous period checkbox will add an overlay dashed line graph representing the data for the previous period. The previous period is based upon what is currently selected for the report date range. For example, if you select a date range of last 7 days, the previous period will be 2 weeks ago. When comparing trends over weeks, it is best to select date ranges that cover complete weeks. For example, if you select a date starting on a Monday, set the end date to a Sunday. If the start date is on a Friday, set the end date to a Thursday. You can also mouse over both the bars and dashed line to see the date and corresponding values. Tablet - Includes iPads, Android tablets, etc. Note: For a complete list of all analytics terms and definitions, see the Analytics Glossary. Having all of the data in the original format from the API allows you to manipulate the data in ways other than what is provided in the UI. Note that the reports support print-friendly style sheets so printing a report or saving to PDF will generate a printer-friendly page. When the Video dimension is selected, a graph will display the number of video views per day for the time period selected. The body of the report lists the video name, video ID, duration and the performance details for each video. Clicking the link for any of the videos will display the performance for that video. Note: If a video that is not your Video Cloud library is played in a Video Cloud player (e.g a remote asset), Other/Third Party will be displayed with no associated video ID. 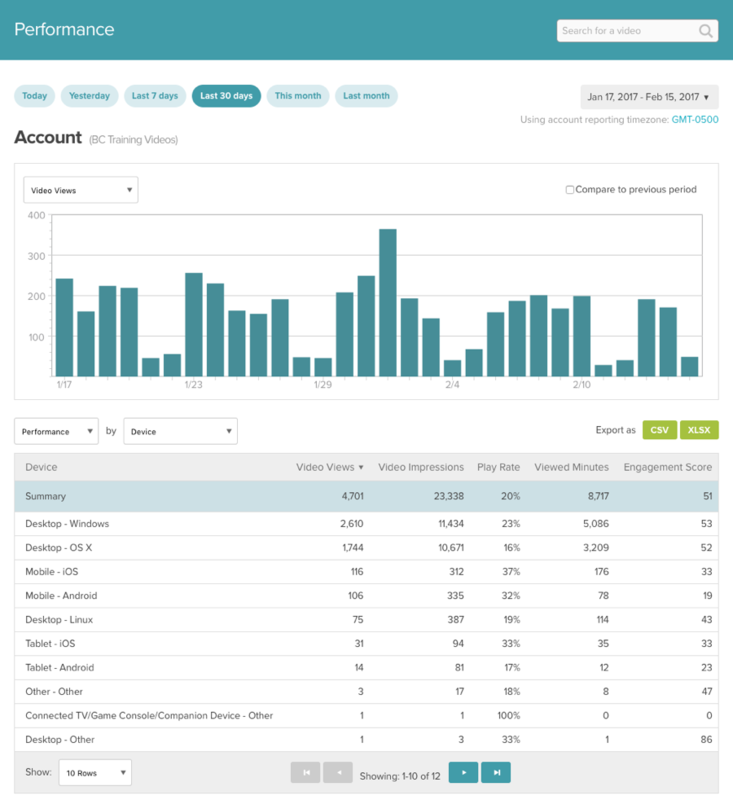 When the Player dimension is selected, a graph will display the number of video views per day for the time period selected. The body of the report lists the performance details for each player. Clicking the link for any of the players will display the performance for that player. Note: Prior to February 2016, players used in apps built using either the Brightcove Player SDK for iOS or Android would display with a player name of Custom or Native Playback. Beginning in February 2016, these players can now be identified using the source and destination values specified in the app. For more information, see either the iOS or Android SDK documentation. 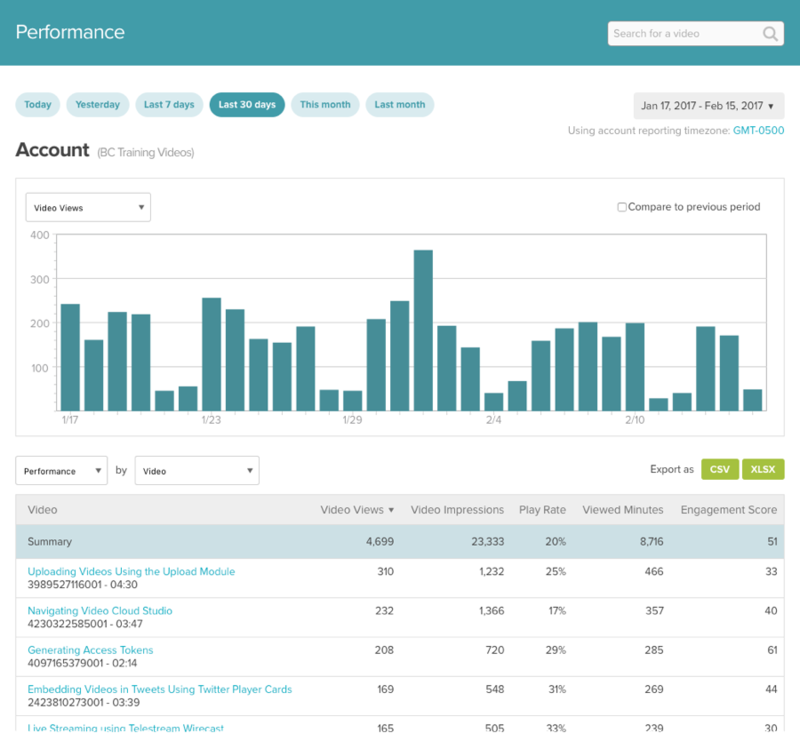 When the Source of Traffic dimension is selected, a graph will display the number of video views per day for the time period selected. The body of the report will display the performance data for each traffic source. Only categories which have data within the time period selected will be displayed. Clicking the link for any of the traffic sources will display the traffic source performance for the selected traffic source. When the Display Domain dimension is selected, a graph will display the number of video views per day for the time period selected. The body of the report will display the performance data for the display domains. The display domain is the domain the viewer was on when they watched a video. Clicking the link for any of the display domains will display the display URLs for the selected display domain. Note: If the player is in an iframe, the display domain will be recorded as the URL of the page in the iframe. When the Country dimension is selected, a graph will display the number of video views per day for the time period selected. 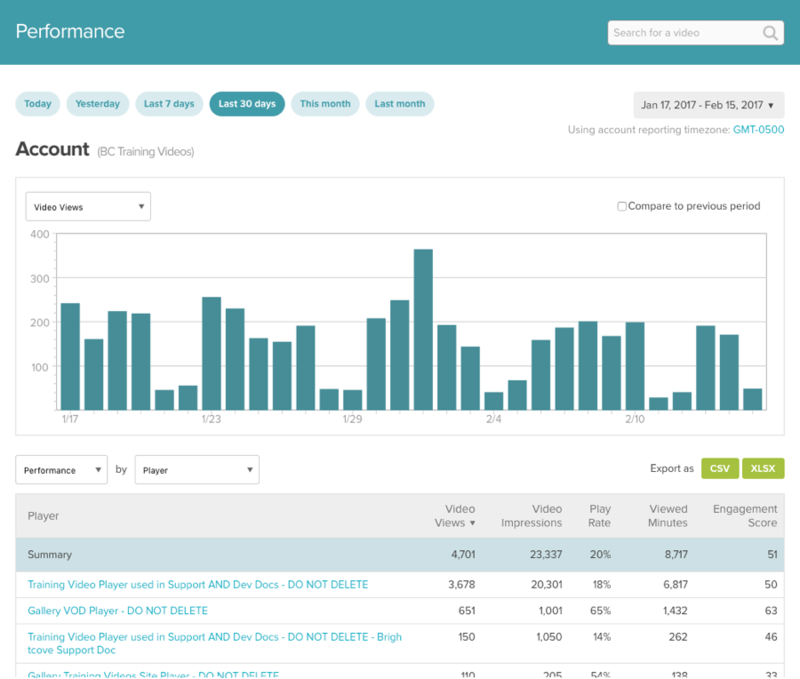 The body of the report will display the performance data for each country where videos were viewed. Only countries which have data within the time period selected will be displayed. Note: Brightcove uses a third-party service to provide us with the IP address and location information. If there is no entry for the IP address in question, we will be unable to get the country information and Unknown will appear. Clicking the link for any of the countries will display the performance by region or city for the selected country, if you are viewing analytics for the account, not an individual video. When the Device dimension is selected, a graph will display the number of video views per day for the time period selected. The body of the report will display the performance data for each Device Type - Device Operating System combination that was used to view a video. Only devices which have data within the time period selected will be displayed. Clicking the link for any of the device types will display the performance by device operating system. Note: The Analytics module determines the device using the user-agent header. If someone is using a device with spoofed headers, the data will be accounted to the header declared. The Analytics module does not make any efforts to prevent the user-agent from being tampered with. 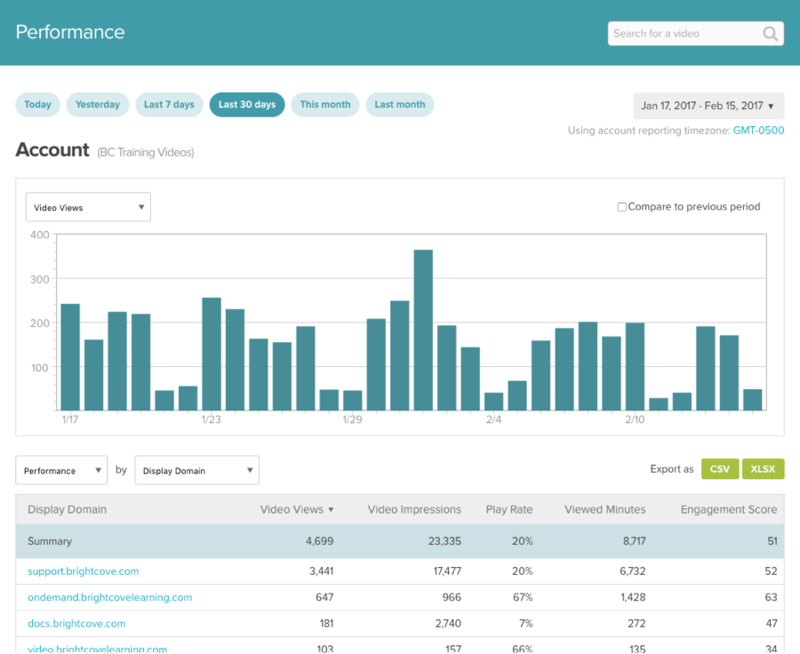 When the Device Type dimension is selected, a graph will display the number of video views per day for the time period selected. 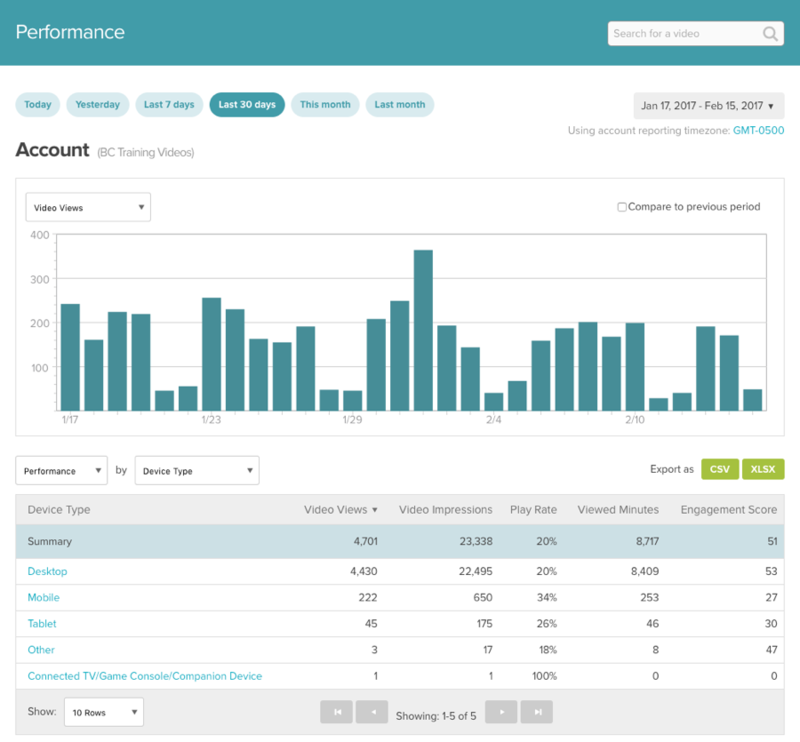 The body of the report will display the performance details by device type. Only categories which have data within the time period selected will be displayed. When the Device OS dimension is selected, a graph will display the number of video views per day for the time period selected. The body of the report will display the performance data for each device operating system. Only categories which have data within the time period selected will be displayed. When the Device Manufacturer dimension is selected, a graph will display the number of video views per day for the time period selected. The body of the report will display the performance data for each device manufacturer. Only devices which have data within the time period selected will be displayed. When the Browser Type dimension is selected, a graph will display the number of video views per day for the time period selected. 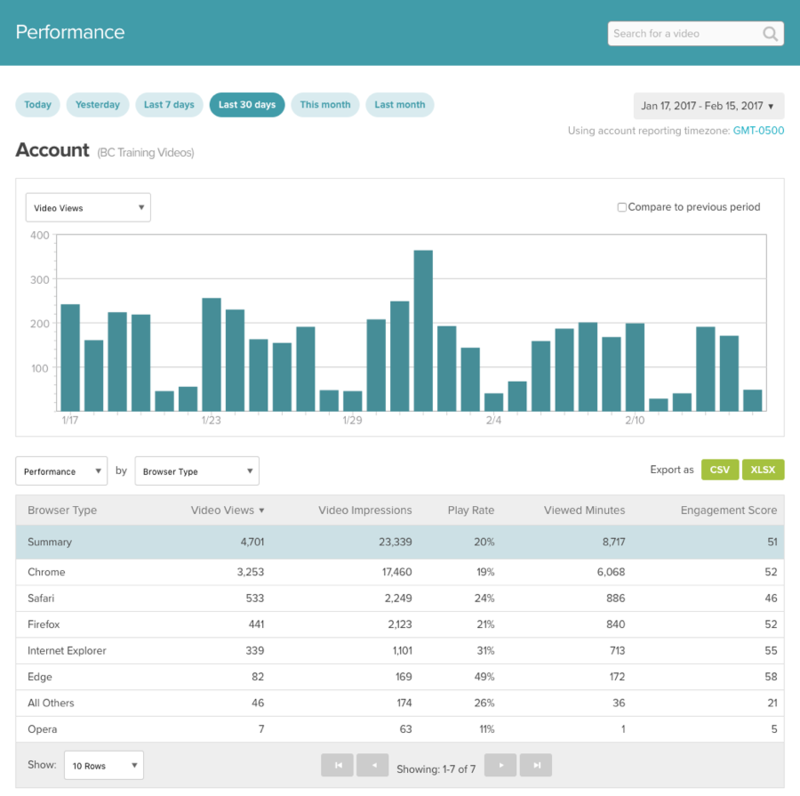 The body of the report will display the performance data for each browser type. Only browsers which have data within the time period selected will be displayed. When the Day dimension is selected, a graph will display the number of video views per day for the time period selected. The body of the report will display the performance data for each day. Only days which have data within the time period selected will be displayed.